Legal risk stems from tort liability - being subject to a civil suit - which is of particular concern to direct marketers. Legal risk also arises from environmental liability, regulations, and the business structure of your operation. 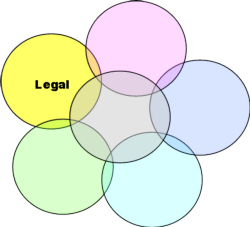 Legal issues cut across all other risk areas: production, financial, human, and marketing. Disclaimer: Reasonable efforts have been made to ensure the accuracy of the information contained on this website. However, the effect of future legislative, administrative and judicial developments cannot be predicted. Use of the materials on this website represents an understanding that the information is for educational purposes only. This information should not be used as a substitute or replacement for individual legal advice. Each individual should consult an attorney for advice and further information regarding their specific situation. Statutory obligations, including taxes, labor laws, use of chemicals, participation in some farm programs, among others. Have I reviewed my property and liability insurance policies? Do they cover risks I might have, such as pollution and livestock? Am I covered when I participate in community activities? Are buildings and equipment that I lease covered? Are my recent acquisitions covered? Does my business structure adequately protect me from liability? Is my current business structure optimal for estate planning and transfer? Does my current business structure optimize my tax liability? What are my options if I must consider bankruptcy or am under threat of foreclosure? Do I need to perform an environmental audit? Do I know about and follow environmental record keeping requirements? Is my knowledge of regulations up to date? Am I aware of all my contractual obligations in the other risk areas of my operation? Carry farm or business liability insurance, including product liability. Be aware: sources of legal risk are more varied and complex for direct marketers, especially for U-picks. Check your business structure! To limit your personal liability, minimize taxes, and to ease estate transitions, look into partnerships, limited partnerships, limited liability companies, and corporations (C or S) as alternative structures. Develop good relationships and communication with your neighbors. Use good agricultural practices to reduce environmental risk. Good record-keeping can prove regulatory compliance. Legal Risk Management: Protecting Your Farm and Family - The National Agricultural Law Center. Summarizes negligence and premises liability, writing contracts, and structuring your business organization to minimize risk and maximize benefit. Family Insurance Planning - Farm and Ranch Survival Kit (Issue 5) - Oregon State University. Short articles on taxes, insurance options, business structures, and dealing with legal dilemmas on a family farm or ranch. Risk, Liability, and Insurance for Direct Marketers - University of Wisconsin. Lays out the ways in which a direct marketer is at risk for liability and describes insurance tools to mitigate that risk. Agricultural Business Insurance - Penn State. Types of insurance you should be thinking about for your operation. Liability Concerns for Farmers Involved in Direct Marketing of Farm Products - Penn State. 2003 legal article. UCSFP - Hardesty - Business Structure Comparison Table - UC Small Farm Program, Shermain Hardesty. Table comparing alternative business structures for closely held joint ventures. Business Organizational Structures and Principles - Colorado State University. Easy-to-read. Describes available farm business structures and give pros and cons for each. Passing on the Family Farm Requires a Specific Business Structure - AgWeb. Discusses the reasons an established business entity is required for passing the farm to a successor and how to go about creating one. Agricultural Legislation: Environmental Regulation and Agriculture. Blog of latest Congressional Research Service reports on U.S. agricultural and farming legislation. California Department of Food and Agriculture. Recent regulatory activity, as well as links to regulations pages for each division of the Department. Twelve Basic Rules of Contracting - Iowa State University. Twelve common principles to keep in mind, regardless of the type of contractual relationship you are entering.